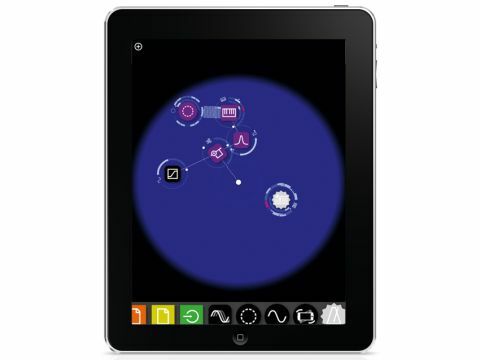 Reactable translates well to the iOS platform, and is definitely worth your time and money. A lot cheaper than the hardware version. Very interactive and great fun. More blocks would be nice. Reactable is an attention-grabbing, interactive instrument that has wowed concert-goers during its appearances onstage with Björk. With its luminescent tabletop and building-block modules, it combines play and performance in a presumably inspiring fashion. We say "presumably" because the thing costs a pretty penny at just under €10,000. You can therefore imagine our glee at seeing this mobile version pop up in the App Store for a few quid. Surprisingly, Reactable Mobile carries much of the functionality of the fully physical version, albeit with a few twists. The main limitation is that you can use only a limited number of each 'block' type in the mobile incarnation (eg, two oscillators, one filter, etc). Reactable is inspired in part by modular synthesisers, with oscillators, filters, modulators, effects, sequencers and more represented as blocks that are placed (or dragged) onto the 'table'. Modules can then be patched together and tweaked by spinning them around, or dragging your finger(s) around the perimeter of a given block. Each block provides a couple of parameters that may be manipulated in this way. For instance, an outer circle surrounding one half of the oscillator alters the played note, while an inner ring displays the octave. The other half of the block provides an amplitude control. You can access further block parameters by double-tapping. For example, the filter block provides filter modes along with cutoff and resonance. The latter two are adjusted via a 2D graphical display. It's all very interactive and extremely intuitive. Along with the usual oscillators, you get some sampler blocks. There's a dedicated loop block, along with an instrument/drum sample player. There are a number of samples included, and you can bring your own in through iTunes or via the built-in web server (which you can also use to retrieve recorded performances in WAV format). Reactable is great fun. We wish we could access more blocks - we'd particularly like more sequencers and filters - but the price is right, and there's no shortage of inspiration on tap. And let's be honest: for most of us, this is as close as we're likely to get to the real thing.